Booth space is available in "Pony Plaza" - This heavy traffic area also is the location of the main event office, the food concessions, and results bulletin board. 400 salmon dinners are served on Saturday night in Pony Plaza as well. Sponsor banners are prominately displayed in jumping venues and advertisements / acknowledgements in the event program. Please join the fun! Simply fill out and send us the vendor form, and we will reserve a spot for you! 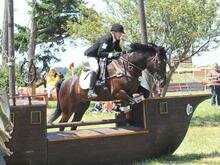 Support Area VII eventing and the Whidbey Island Pony Club - and get your business seen by hundreds of eventing enthusiasts! Almost 300 competitors, hundreds of spectators, volunteers, and officials. . .
Concession Stand will open Thursday afternoon and then daily at 7:00 AM.